R&D and information managers routinely use keyword search to find information they need. 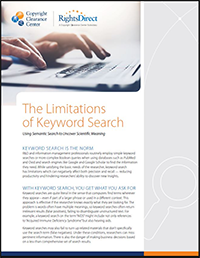 While keyword search may satisfy the basic needs of researchers there are limitations that can affect productivity and slow the pace of discovery. Learn how semantic search can improve precision and provide you with more comprehensive and relevant search results.